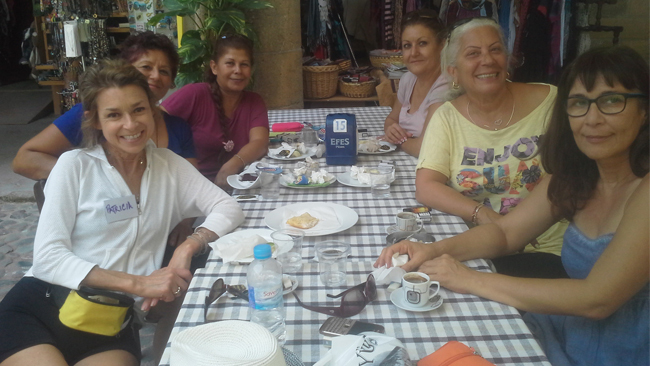 After a bicommunal UN Women’s Walk through the old city of Nicosia, U.S. Fulbright Scholar to Cyprus Patricia Martin (L, front) speaks with Cypriot women about their common human rights to privacy and no contact in cases of abuse. Patricia Martin, a U.S. Fulbright Scholar to Cyprus in 2014-2015, has continued to make an impact in the country despite completing her grant. Ms. Martin first traveled to Cyprus to launch “One Woman at a Time” (OWWAT), an organization which helps victims of domestic violence gain access to the court system in order to seek protection against their abusers. While in Cyprus, she worked tirelessly on her project, which included teaching young law students at the University of Nicosia, working with the Supreme Court of Cyprus and the Family Court in Nicosia, and meeting with various NGO’s, officials, and other important figures to advance her organization. She also made frequent appearances on radio, newspapers and gave public lectures about her project, in both Turkish Cypriot and Greek Cypriot communities of Cyprus. Her hard work during her time as a Fulbright scholar has recently been recognized internationally by the American Bar Association’s International Human Rights Committee. The national website she created in order to provide self-help to victims of domestic abuse was recently selected by Stephanie Williams, co-chair of the ABA Human Rights Committee, as one of the top 16 global human rights causes to support in 2016.